Image caption Lord Justice Gross said the case was "detrimental to the conduct of a major issue of national and international importance"
A legal challenge to Brexit has been rejected by the High Court. Swindon campaigner Elizabeth Webster brought the case against the legality of Britain's declaration to leave the European Union. Lawyers for Ms Webster, who spearheaded the crowdfunded effort, hoped to win permission for a judicial review and halt Brexit negotiations. 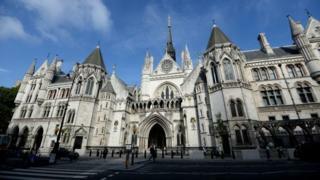 But following a two-hour hearing judges said the case was "hopeless and totally without merit". The case had challenged whether the British government's Article 50 declaration was sufficient and claimed that the government had not properly consulted parliament about leaving the EU. Image caption Elizabeth Webster said "people feel passionately about protecting our constitution". Thousands of people donated to a crowdfunding appeal that raised more than £180,000 to bring the case. Ms Webster, 54, who ran as a Liberal Democrat candidate for North Swindon in the 2017 general election, said members of the public "felt passionately about protecting our constitution". She was seeking a declaration that no decision to withdraw from the EU, for the purposes of Article 50, had been made. Hugh Mercer QC told Lord Justice Gross and Mr Justice Green: "It is a public interest challenge which aims to ensure simply that the law is applied." He told the court that the campaign was not seeking to nullify the negotiations that had taken place to date. The claim was contested by Brexit secretary David Davis, whose position was that it had no merit, was not brought promptly and was detrimental to public administration.